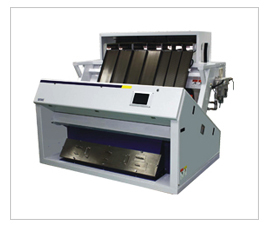 The REZS series color sorter is based on new generation Satake Trichromatic Full color camera technology which enables it to see all the colors as near to human eye. Full color camera allows machine to detect and sort grains with smallest of color difference and sort material with several color defects. Machine runs at high capacity due to bigger Sorting area. REZS series also equipped with triple sorting and reverse sorting technology to finalize rejection in Single sort. Satake Affordable and low cost Tri Chromatic Color Sorter Suitable for :- Rice, Wheat, Grains, Cereals, Pulses/Lentils, Cashew, Peanuts, Almonds, Sunflower Seeds, Paddy Seeds, Sesame Seeds, Coconut Flakes, PET Flakes, Maize, Guar Gum, Poppy Seeds, Semolina, Nuts, Tea, Coffee and Plastic Flakes and other commodities of similar nature.